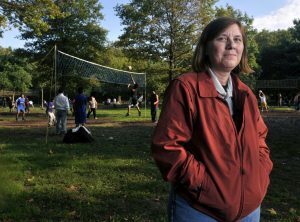 Lori Walters. Photo by Brad Horrigan. * * *Coinciding with the 300th anniversary of New York City, the 1964 World’s Fair offered an awe-inspiring array of whimsical rides, displays of state-of-the-art technology and glimpses of exotic cultures. Many of the 140 pavilions looked to the future, imagining radical, wondrous changes in the life of the average American. Organizers slated the fair to run for two six-month seasons, from April to October in 1964 and ’65. 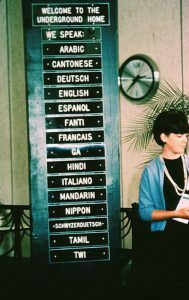 A page from the World’s Fair official guide book. A sign welcoming visitors to the Underground Home. Photo courtesy of Bill Cotter of worldsfairphotos.com. 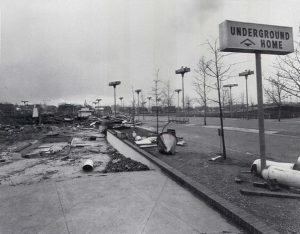 An image purporting to show the “demolition” of the Underground Home after the fair ended. Photo by Bruce Davidson/Magnum Photos, Inc.
* * *Dr. Walters wants to solve the mystery. 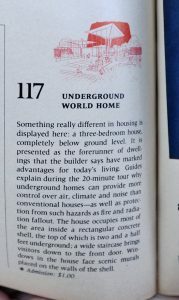 She cannot turn to Swayze or Henderson, both of whom have died, and Swayze’s book, “Underground Gardens & Homes,” does not cover what happened to the Underground Home after the fair. It’s hard to definitively piece together the fate of the exhibit from newspaper articles and the official records of the fair, which are housed at the New York Public Library. Quinterno got to thinking. His dad had visited the fair and described its enormity to Steven, who couldn’t comprehend how the Underground Home might actually remain beneath the park. “How can something that was part of this gigantic, prominent festival just be forgotten?” he wondered. Quinterno went on to read several books on underground homes, including Swayze’s. He even tracked down Girard Henderson’s nephew, who politely said he didn’t know much about the Underground Home. * * *Digging for the Underground Home doesn’t make sense to everyone who went to the fair. Author Larry Samuel, who researched the exhibit for his 2007 book “The End of the Innocence,” doesn’t share the enthusiasm for excavation. He understands the passion people still feel for the fair—an emotion that he shares, having visited himself—but he believes the excavation would be a misguided attempt to re-live the past. * * *Online banter about the Underground Home also intrigued Trey Callaway, who grew up in Oklahoma but feels a deep bond to the fairgrounds. His parents went on several dates at the fair, and they joked that he was conceived there. Callaway even proposed to his wife at the Unisphere.